Gordon's String Music is located at 1903 North Monroe Street in Tallahassee, Florida 32303, south of I-10 and north of the capital building (map). 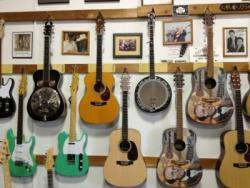 Gordon's offers lessons, string instruments, string accessories, and repairs. Store hours: M-W 11:00am-7:00pm, Th-F 11:00am-6:00pm. Closed Saturday; open by appointment only. Email or call us at (850) 386-7784. The store opened thirty-one years ago. It is a family owned and operated music business started by musician, educator, and luthier Gordon Scott and his wife Jane. Gordon’s is referred to as the “home of traditional music” in Tallahassee.